Friends, do I have updates! So, if you read my most recent post…well my second most recent post, you know that one of my goals for 2017 was to start hand-dying yarn. And folks, I’ve done it! The first skeins were dyed from differing amounts of the blush and green colors you see there. The second image is of a skein I died with the rest of the green dye stock with some back speckles. The shawl folded up next to the skein is the inspiration for the color. Came out pretty good, right? I’m happy with it. It was a pretty easy and painless process. Honestly, I was a little nervous going in to it thinking that it could go really wrong, but you learn pretty quickly that as long as you have a decent handle on colors that look even remotely good together, you’re going to end up with something nice. There is definitely more dying to come, which leads me to…. my new podcast! I had mentioned in my second most recent post that I had something planned that I would be talking about in future posts. Well, this is it. 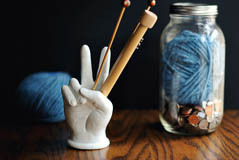 I have broken into the small-niche-podcast scene with a new knitting podcast called…..wait for it…..Wool, Needles, Hands! I have also started a vlog to accompany my podcast and to chronicle the process of reaching my creative goals. If you like it, please subscribe! I’d love to take you along with me on my crafty adventures of 2017. Beautiful yarns! I’m impressed with your abilities. That green color is sooooo lovely!